Lisa Nielsen: The Innovative Educator: Why on earth would 2nd graders use Twitter? Read this to find out. Why on earth would 2nd graders use Twitter? Read this to find out. When the second grade students in Courtney Woods class were studying places tourists like to visit, they wondered how they could get more people to visit their small Canadian town of Bathurst. Their teacher knew this was a great idea and discussed with the class the importance of sustainable tourism. The class decided they wanted to help Bathurst become more of a tourist attraction and do so in part by connecting to the larger world so more people would know to come to their great home. The class decided that they would use a tool called Photosynth to take digital pictures of the Promenade Waterfront. Photosynth provides a panoramic view with the ability to zoom into individual shops, services and attractions, allowing people to learn more about what the region has to offer. Students decided to compose and edit their own descriptions of each building in both French and English, representing the rich bilingual makeup of the community. The end result was phenomenal. You can check it out here. The point of their work was to attract tourists to their town. To do that they decided to use Twitter to let people know they could take a virtual tour of Bathurst that they hoped would entice people to come visit. They decided to use Twitter as a primary outreach tool. Because you must be 13 to use Twitter, the teacher set up a class account and together she and the class decided who they wanted to reach out to and how as per the Tweet below. Reach out they did. The class researched local media, the Minister of Education, the Prime Minister, the tourism bureau and even Bill Gates! These kids meant business. And, guess what? People cared and responded! You can see some of the responses below. 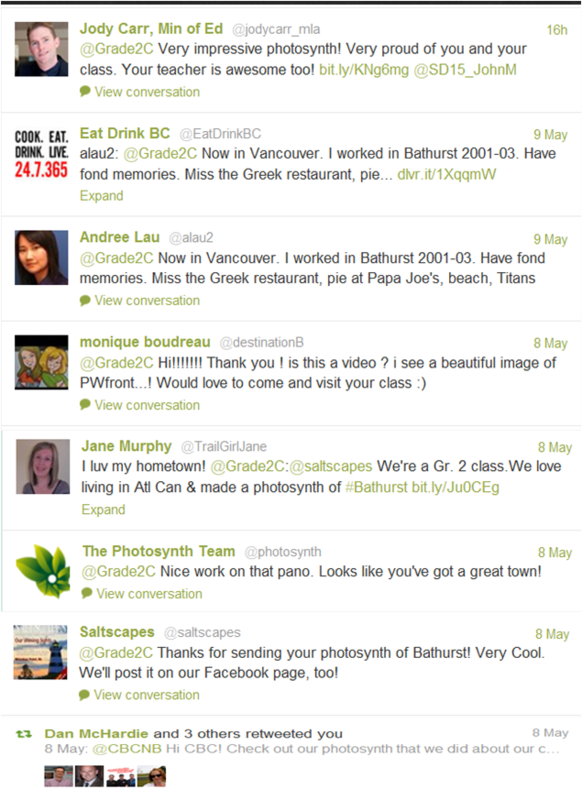 The class was thrilled to receive Tweets from the Minister of Education, Photosynth, local media, and others. What's more is they had the hosts of their favorite show, "Experience Bathurst" visit their class, speak to students, and stay to sign autographs. Then the local tourism bureau liked their project so much they now use it to help attract people come to Bathurst. And, Bill Gates? Well he invited their teacher to come to Microsoft's Partners in Learning Global Forum in Prague where I had the good fortune to meet Ms. Woods! So, when someone asks you, "Why on earth would elementary students ever use Twitter?" just tell them the story of how Ms. Woods 2nd graders use Twitter to bring the world to Bathurst. You can read more about the project at Ms. Woods page on the Microsoft's Partners in Learning site here. Wow I'm impressed with Courtney Wood and her class. She really created an authentic unit on ICT and tourism. Bravo! When I was still working on my masters I struggled to find a way to incorporate twitter into the classroom. My students were very technologically behind due to lack of district resources. Twitter is one of the bigger social media sites so I wanted them to be familar with it. I decided to create a blog and a link to a classroom twitter account on that blog. Most of my students had no concept of a hyperlink at the time. I was shocked to find this out. Anyways, I would have them write a summary on our blog of a story we read then tweet their main idea. Sometimes I would instruct the students to create their own classroom newsletters and tweet the "big" thing going on that week. They loved it and it gave them exposure to today's technology. Classes a la carte - I like this! I hate school, but I love learning.